The scholarship situation in Bloomington is starting to sort itself out. A couple of weeks ago, the Hoosiers were oversigned by a scholarship and speculation grew on players considering a transfer. First, it was Malik Story. And now, his roommate and fellow freshman Nick Williams has also decided to leave the program. The decision by Williams is a curious one considering he originally signed with Marquette and then followed Crean to Bloomington last spring. But when you consider that Maurice Creek is coming into the program, Devan Dumes commands his share of looks and Verdell Jones came into his own down the stretch, Williams, like Story, would likely have taken a tumble down the depth chart. As of right now, IU will enter next season with 12 scholarship players. There is, however, a possibility that another player could be added to the 2009 class as the staff continues to evaluate talent this spring. Korman’s story also reported that walk-on Broderick Lewis has left the team. The complete release from IU, with more comments from Crean and a quote from Williams, after the jump. BLOOMINGTON, Ind. – Indiana University men’s basketball coach Tom Crean has announced that freshman forward Nick Williams, a native of Mobile, Alabama will not return to the program. Williams started 29 games and averaged 8.9 points and 4.5 rebounds. He was fourth on the team averaging 26.5 minutes per game. The Hoosiers will have one open scholarship for next season should they choose to use it. competition that is in front of them as we rebuild this great program,” Crean added. A lot of interesting reactions here. I'm dissappointed with a few comments about NW. That guy had a lot of passion. He chose to pursue the rats nest that was IU basketball 2008-2009 and I give him a lot of credit for that. As far as the “excuse” they gave? They have to say something. Fact is he was looking into the crystal ball and PT was not looking good. I agree with the Mo Creek theories. That guy will start. If we end up going, Rivers, VIII and Dumes, who guards the small forward? Rivers while Dumes guards the point? I guess it's possible. There is more talent left on the table for 2010 than 2009-10. I hope we pursue the 2010 class because we still aren't competing at a high level this fall. Every team needs a Matt Roth. We have to understand, IU did not have the inside/outside talent to free this kid up. Every team played us on the perimeter. He could develop into the best pure shooter in the Big Ten if he isn't already. I liked Story and Williams. What we are seeing is the painful part of this rebuild is not over. It's a process that continues to show its ugly side. I'm looking forward to it moving on…….. I think Dumes would be good coming off the bench. All Roth needs to do is work out, he has the basketball skills just needs to hit the weights and get into great shape. One thing i hope we wont see next year is VJ3 throwing those hero type of passes that get stolen 99% of the time. I don't think he will throw as many because there is now someone off the bench that TC can stick in for him. There is a bright future for this squad, I can feel it. best of luck to him. He fought the good fight. 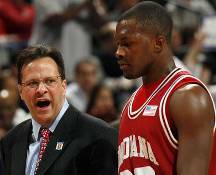 He was a part of a team, that, for better or worse, we won't soon forget here at IU. I liked Nick's effort & enthusiasm, best of luck. I think that the logjam at the 2/3 has him thinking of reduced PT. However, he seemed to be coming around toward the end of the year. His experience this year would have given him a big competitive edge. His impatience is sad, but common nowadays. Perhaps, many arrived hoping for big minutes at a D1, but the fact of the matter is, the work is hard and long just to compete let alone start or play serious minutes, even in a struggling reloading program. So, the key question is would you rather probably play more minutes at a mid-major OR play for IU no matter the situation & just work to earn your minutes?!? Personally, I want those who REALLY want to be at IU and are not afraid of good competition to get to play. I would argue that Dumes's experience should be in the game when Hulls is and therefore agree that coming off the bench might eventually be DUmes's role. In addition his mentality is to make stuff happen which is one of the most valuable assets of a bench player. I thought he had a chance to be really good, and become a really good defender, Ron Artest type. I think he will be missed. I think the coaching staff has a great deal of power and influence in who will stay and who will leave. Crean recruited the best he could get for this past year but it is obvious that all coaches over-sign if they find a really good player. They do this because they know they can loose the kid one way or the other if they need to. Once again, another example of Tanned Tommy chasing off a young man to whom he made a promise. All you folks at It's Indiana, It's Indiana better get used to the annual exodus of players who are being driven from Bloomington like St Patrick and the snakes.